Love the flavors that went it to the cookie. Coffee and Cinnamon are my favorite and I totally love this !! Absolutely delicious and awesome cookies! Wow wow priya..that's such a delicious treat .. Very Flavorful and healthy Cookies!!! Cookies really looks superb!Thanks Priya for sharing ALWAYS the wonderful recipes. Well baked and what a flavor it carries ! They look really nice, I like all the ingredients! Coffee and cinnamon punch is really attracting me Priya :) Awesome!! Heureusement que j'ai acheté en Angleterre une mesure en cups ! Je vais pouvoir faire ta recette qui me plait beaucoup ! Delicious cookies, adding coffee flavor might have made them taste super yumm! Looks really nice and Perfect ! yum flavours for a cookie to have.....and healthy too! The cookies look crunchy...n delicious! coffee and chocolate always marry well together - these must be so good! 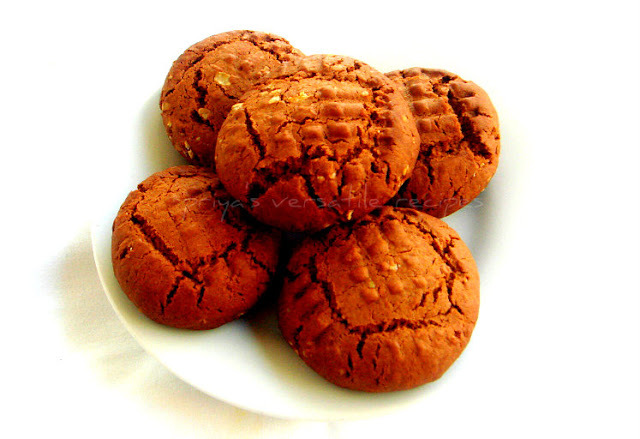 These coffee cookies are looking so delicious...looking at them just made my mouth watery....i am getting so desperate to have these cookies.Yummy!